I started this page wanting to get back to the fine little details I have been longing for so long. I have gotten away from the projects that took more than ten hours to complete and moved to simple doodles that I could complete over a 45 minute lunch break. I love that I am able to merge back into the more detailed. of course I’m not going to jump into a 10 hour doodle at once, so I decided to ease myself into it. This piece took just over 3 hours to complete from start to finish. It is not the best feather I have ever drawn, but I’ve only drawn two total, so it had a 50% chance. I wanted to just zoom in a little so you can see what i’m talking about. 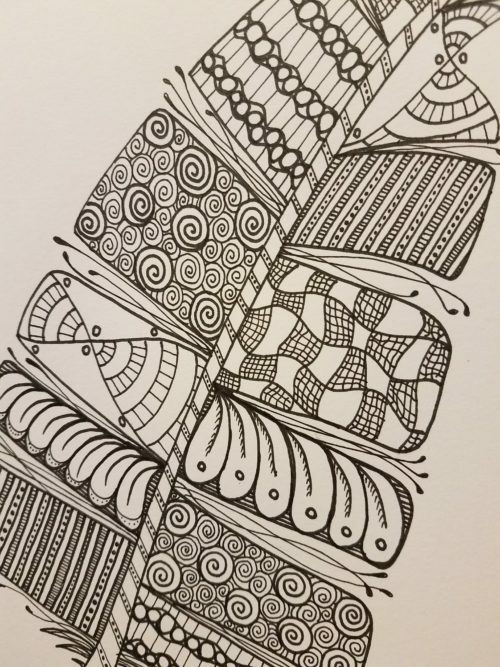 I used Staedtler Pigment liners .08 and .02 to complete this feather. There were some patterns I have done before on here and some that I just made up as I went along. What are some of your favorite elements of this feather. Share with me in the comments. Also, if you have ever drawn a feather, I would love to see what you came up with. Link it with your comment so I can take a look!